A specialist of probability theory and its applications, Gérard Ben Arous arrived to NYU's Courant Institute as a Professor of Mathematics in 2002. He was appointed Director of the Courant Institute and Vice Provost for Science and Engineering Development in September 2011. A native of France, Professor Ben Arous studied Mathematics at École Normale Supérieure and earned his PhD from the University of Paris VII (1981). He has been a Professor at the University of Paris-Sud (Orsay), at École Normale Supérieure, and more recently at the Swiss Federal Institute of Technology in Lausanne, where he held the Chair of Stochastic Modeling. He headed the department of Mathematics at Orsay and the departments of Mathematics and Computer Science at École Normale Supérieure. He also founded a Mathematics research institute in Lausanne, the Bernoulli Center. He is the managing editor (with Amir Dembo, Stanford) of one of the main journals in his field, Probability Theory and Related Fields. 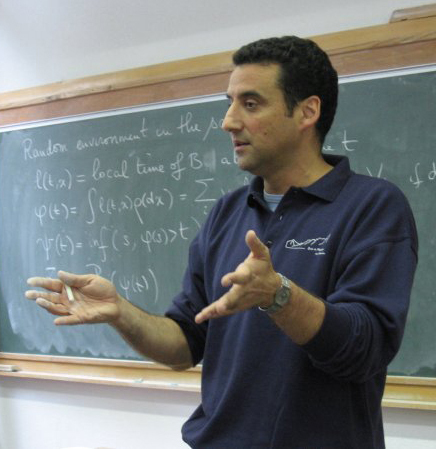 Professor Ben Arous works on probability theory (stochastic analysis, large deviations, random media and random matrices) and its connections with other domains of mathematics (partial differential equations, dynamical systems), physics (statistical mechanics of disordered media), or industrial applications. He is mainly interested in the time evolution of complex systems, and the universal aspects of their long time behavior and of their slow relaxation to equilibrium, in particular how complexity and disorder imply aging. He is a Fellow of the Institute of Mathematical Statistics (as of August 2011) and an elected member of the International Statistical Institute. He was a plenary speaker at the European Congress of Mathematics, an invited speaker at the International Congress of Mathematics, received a senior Lady Davis Fellowship (Israel), the Rollo Davison Prize (Imperial College, London) and the Montyon Prize (French Academy of Sciences).